This is Day 6 of Sleepopolis Latex Mattress Week and we are extremely excited to announce a giveaway of a brand new Zenhaven mattress! The Zenhaven made our list of best latex mattresses as the best latex for side sleepers! The Zenhaven is a flippable mattress that has what they call their Luxury Plush feel on one side and a Gentle Firm feel on the other. The mattress has two 3″ layers of Talalay latex at its core to provide support regardless of which side of the Zenhaven you sleep on. Need to know a little bit more about the Zenhaven before you throw your hat in the ring? 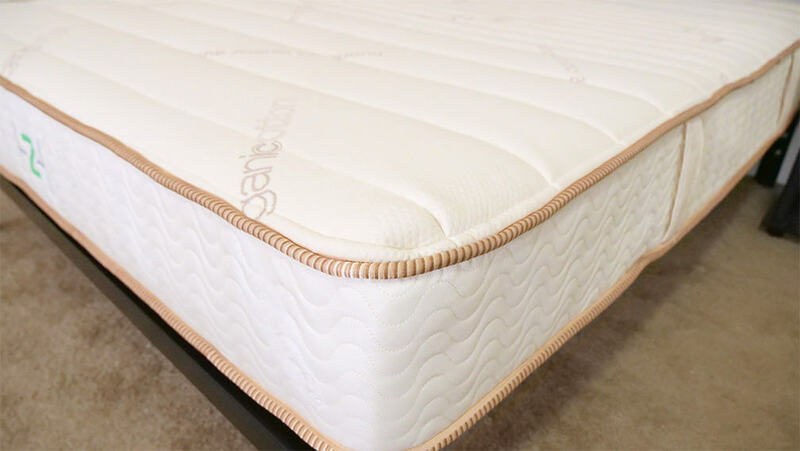 No problem, you can check out our full review to get an in depth look at this great mattress from Saatva. Be sure to enter the giveaway for your chance to win a brand new Zenhaven. If you haven’t been following along with Latex Mattress Week there is still time to enter into the other giveaways we’ve kicked off over the last few days as well! I wish I could own a zenheaven. I would choose the Zenhaven mattress because I’m a side sleeper and it seems to be the highest rated. Zenhaven is my favorite!! Would be such a blessing to win this!! It’s telling me I’m leaving a duplicate comment when I didn’t comment until now, but a new bed would be nice and hope this comment will take this time! I could use a good bed, mine is a cheapy! The Zenhaven is my favorite! I think it is the best one for me! The Purple is appealing as it stays cool, but the Zenhaven is my first choice as I’m a side sleeper. They all sound lovely though. Love all the reviews! I would love to try a Zenhaven! Thanks for the oppurtunity! This would be AMAZING!! We have needed a new mattress for sometime now. Just never in the funds. But man they look like heaven! Fingers Crossed! Good luck to all. These mattress looks like it feels as if you’re sleeping on clouds! I will be 58 next week and have never had a brand new mattress. What a wonderful birthday present this would be! My husband and I are both side sleepers on a king bed. I really need a good mattress. I have a lot of neck and back problems. I love that its flippable for 2 diff feels. Oh my this would be an amazing win! I would really love to win this mattress! Zenhaven looks amazing! Would love to give it a try! The Zenhaven looks just what I need! Oh wow!!! These look so comfy!!! A new mattress would be so heavenly!!! I love the names of the mattresses! Nice prize, hope to win! The zenhaven seems to have the most qualities that appeal to both my fiance and I.
I want to win this mattress! I would ❤ to have this mattress!! I would be 😴😴😴 like a 👶… Good luck everyone!! So far I like the Sleep EZ Roma best, but I’d love to win this one. They all look good to me. The Leesa and the Zanhaven seem to be the top ones . The zenhaven is my favorite mattress. Casper mattress is a close 2nd place. They’re all wonderful really. This one is my favorite, the Zenhaven. Both a side sleeper and stomach sleeper so it would be a blessing to win any one of these giveaways! I want to win this prize. It looks so comfortable. Sherry S.
I’m so do for a new bed it isn’t even funny! My current bed has been through the work out for sure! Lots of bed time….3 foot surgeries, 1 neck surgery, 2 lower lumbar surgeries, 1 stomach surgery, 1 total hip replacement and now the Dr tells me my shoulder and other hip aren’t doing well either. Especially the shoulder…it’s next! 1 side of the bed is worn down. I keep trying to use the other side of the bed but it only makes my husband roll out of bed and it the floor! He actually hit the night stand and ripped his ear almost off he had to have it stitched back on! Not a joke either…we need a new mattress and time to toss this mattress….It’s time to get rid of our “bad luck charm”, the bed! A flippable is a plus, and I’m a side sleeper, thus, your review convinced me! The Zenhaven would be my choice. I am a side sleeper and would sleep on the plush side. I love how it is cool because sleeping hot is miserable. I have a REALLY hard time sleeping, i am up every couple hrs because of Fibromyalgia and sciatica. I am a side to belly sleeper and i wake up in such awful pain. This is the first time I have ever heard of these mattresses but they sound like HEAVEN !! Thanks for another great giveaway! Continuing to hope……and lose sleep – LOL! A lot of great choices, but I think the zen haven is my favorite! I sure can use this Zenhaven mattress to help with my copd. I LIKE THE SLEEP EZ ROMA! The Nest Hybrid and the Avocado sound wonderful to me, but the Zenhaven is also in my top four of the beds I’ve read the reviews on so far, and really almost any bed that didn’t have horrible pressure points would make me one happy person. Mattress for Less Flip-able looks good to me! Im a side sleeper….would love this one!!! My wife has had severe sleep issues for years and this looks like it might solve her problem. We’re retired and on a fixed income and to win this would be a blessing for her for sure. In the name of great sleep and value; I’ll take the Sleep EZ Roma. This is the mattress of my dreams just because i co sleep with my 2 yr old right now and having to sleep on my side it sometimes feel as if my side is bruised. This would be an answer to all my problems! Fingers are def crossed! These mattresses sound Amazing. The reviews are very helpful when trying to figure out which is best for your family. Zenhaven would be my favorite right now. I would love Zen mattress, supportive yet not too firm for a side sleeper and could sleep cool. Perfect! The Zenhaven mattress was made for me, a side sleeper. This looks like a sweet matress! I’m a side sleeper that also tends to roll from side to side, so this mattress is probably best for me. I like the Zenhaven so I would love to win! I like the Zenhave being its flexibility w/2 sides and 2 varying options of hardness. Zenhaven would be my choice. This Is calling my name! This has to be perfection. Zenhaven is what I like . Great prize! I need this! Love This ! Im sleeping on a couch bed ! Can you say Uncomfortable?? I would love to win a new mattress. Mine is so old. This is a hard choice all of them look so amazing I’d have to say Zenhaven mattress though thank you for this chance! I think that the “Big Fig” would be a great addition to my husband & myself. In the past year, my Husband was diagnosed with Sleep Apnea and his weight is a “big” part of that. Also, when he doesn’t sleep well, I do not sleep well. I am no skinny minny either. I read that this beds sleep system was built from the ground up to provide a mattress that fits all of the needs of a bigger figure. This would fit our lifestyles perfectly! I would love to give it a try. Love Latex! This mattress just made its way to the top of my list. Zenhaven because its rated best for side sleepers. This would be so wonderful to win! Thank you for the chance. The Zenhaveni sounds great to me! After reading the review, I would love to try this one for my back issues. I haven’t been able to sleep in a bed for over 8 yrs. Looks comfy, I like the variable options. I like the Ghost Mattress. I would love any of them, but I think the Ghost Mattress would be best. I think the Zenhaven is my favorite mattress, so far, out of this weeks mattressses. Love the Luxury Lush side since we’re both side sleepers! I would totally freak out if I won this mattress! I wave up every morning in pain from the mattress we have right now… I hate our mattress and hate going to bed! Thanks for the great review!!! Really need a new mattress for my bad back ! This is the one! This is what I need. I am a side sleeper with insomnia. I also have to use a C-Pap machine. Nights have been horrible for me. Plus I have to deal with the pain from being injured in Iraq. I can’t afford to just buy one of these. Even at 90% disability from the VA, finances are really tight. I like that its flippable with 2 different sides, interesting! This is a hard choice. My hubby would this mattress since he is a side sleeper. I’m getting more excited about this mattress giveaway with each day’s new videos and mattresses! This is a fun giveaway! I”m liking what I see with the Zenhaven mattress since I’m a side sleeper and that’s what it’s best for. I’ll definitely have to investigate this one a little more. Great in-depth reviews, everything I need to make a choice. The review of the Zenhaven mattress intrigued me as it has plush on one side and medium firm on the other, very interesting. I liked the review of the Zenhaven because it said it was especially good for side sleepers like me. I would love a Zenhaven!!! Thanks for putting together latex week. I would really enjoy the Layla mattress! Thank you for the chance! I would love to win this latex mattress! Thanks for the chance! I haven’t ever had a brand new mattress. I would love to win this mattress now that I live with my children my bedroom is my sanctuary. The Zenhaven Mattress looks great but is out of my price range. I really like the Latex for Less Mattress. Ghostbed I think is the best mattress. The GhostBed is my favorite latex mattress you have reviewed. thanks for another chance to win a great mattress,i am learning so much reading your reviews ,i never knew there were so many great choices out there and learned about these new to me brands also will make sure to spread the word to family and friends!!! I’m a side sleeper and I would love to have this mattress! That bed looks so comfy and the view is fabulous. This bed sounds awesome! I hate that sinking in feeling. I definitely want a bed that doesn’t do that. Another great contest. Now if I won a mattress, it would feel like Christmas in October. DH is a side sleeper and like this latex mattress friends m ZenHaven. I like the avacado brand. This would be a great improvement from the hard mattress i sleep on. The Idle review says it’s good for side sleepers so I would choose the Idle. I think the Avacado Green would be my first choice. Since I’m primarily a side sleeper I will have to say the Zenhaven is my favorite latex mattress. Thanks for such great reviews. You cover so much information on each mattress. Plush beds since they are organic. I’m a side sleeper so the Zenhaven sounds the best, but I also like the Latex for Less mattress. Which Latex mattress is best for spine alignment? DELIVERY MAN.. THANK YOU FOR THE CHANCE, AND ALL THE DIFFERENT CHANCES. My back really would love a new bed. My fiance and I were homeless for 4 years before having my son who is now 2 and has alot of medical conditions. ( Our homelessness was not due to drug/alcohol abuse, it was due to not having family and loosing our jobs due to temporary health problems)We lived with a friend when we had him and slept on the couch for a little over a year. We busted are butts working all the hours we could to get and keep a place. He works in a machine shop and also works on old/new farm equipment about 60hrs a week, I am a caregiver, I work nights from 9pm-10am 4 nights a week for an amazing 100yr old lady, sometimes I end up picking up more shifts and end up with 70+ hours. I sleep on a recliner at work if I can fall asleep. We moved into our place 10/27/17 and slept on an air mattress until 2 months ago when his brother was getting a divorce. We are very grateful for everything we have but the mattress he gave us is 20yrs old and has a huge dip in the middle, we honestly were more comfortable on the air mattress lol. 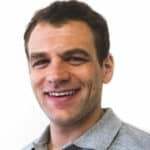 We have not been able to afford a new mattress yet, I have entered almost every mattress giveaway I could find and applied for every mattress product testing opportunities with no luck. As you can imagine our credit is shot right now and were doing what we can to fix it. If we won any of your giveaways, I wanted you to know that you picked a family who was in need and deserve it. Thank you for your time. I liked them all. I am leaning towards the Zenhaven flippable . I could use that. So far I think the Avocado Green might be the best for me, but I need to look at more. I thought I liked the other latex mattress, but then I read the review on the zenhaven and I changed my mind to this mattress as my favorite. The Zenhaven sounds like the best match for me!!! The spindle is my favorite so far! I was hoping as a side sleeper this one would do a better, especially since I really like a softer bed I sink into. However, I don’t sleep on my back simply because my current ancient mattress is so terrible with no support at all, just poking springs. I’d love to see if this one might work! My son purchased the Zenhaven after reading your review and absolutely loves it. As a side sleeper, Zenhaven really appeals to me. All the mattresses sound great, but this one does seem quite suited to me.